Our good friend, Teresa, recently joined me for a baking date. We had a single goal in mind, tackling the dreaded Macaron, that little french confection that strikes fear in the hearts of even the most experienced bakers. Like good students, we both did our homework; searching the internet for tips, watching Macaron making videos, memorizing pictures of properly whipped egg whites, studying the critical "Macronage" process, deciding how long to age the egg whites, contemplating whether or not to let the Macarons rest before baking and what baking temperature to follow...all of the issues that perplex anyone who sets out to bake Macarons. So with happy hearts, joyful anticipation and high expectations, we started our day. Folding and piping and hoping and dreaming of tiny little feet, not the kind that go pitter-patter but the kind that brings smiles to the faces of all Macaron bakers, the sure sign of success. The end result? Well, while we did have some missteps, we were successful in baking up these little beauties....feet that would make a Mama proud! Teresa and I have vowed to continue to perfect our Macaron baking skills until we can effortlessly whip out batches of these coveted cookies. While our quest continues, we did come up with a few tips of our own that we hope you will find helpful should you decide to embark on your own quest for Macaron perfection. 1. Do yourself a favor, use a Silpat mat! I know a lot of recipes recommend parchment paper but we had trouble removing ours from the parchment. 2. Weigh your ingredients using a digital scale. 2. Don't underwhip your egg whites. They definitely need to be stiff but don't over whip either. I know, it's tricky! 3. Make sure your dry ingredients are well processed with no lumps before folding them into the egg whites. 4. Don't overfold. I've read that you shouldn't need more than 50 strokes for this process. 5. Don't follow a recipe that gives you a weight range. Weights should be exact! 6. I used a double layer baking sheet (one baking sheet on top of the other) to bake my Macarons. I read that it helps develop the "feet". 7. If you have trouble determining if your Macarons are done, I've read it's better err on the side of overbaking rather than underbaking them. If you allow the Macarons to "age" after filling them (ie eat them the next day), the filling will actually permeate and soften the cookie giving it better flavor and texture. 9. Keep practicing and experimenting to find out what methods work best for you. 10. Do have a friend that you can laugh at your mistakes with and who uses her photography skills to make you look good : ) Thanks Teresa! Line 2 baking sheets with parchment paper or Silpat mat (I recommend silpat). Have a pasty bag with a plain 1/2" tip ready for piping. Grind together the powdered sugar, almond flour and cocoa powder in a food processor until there are no lumps. 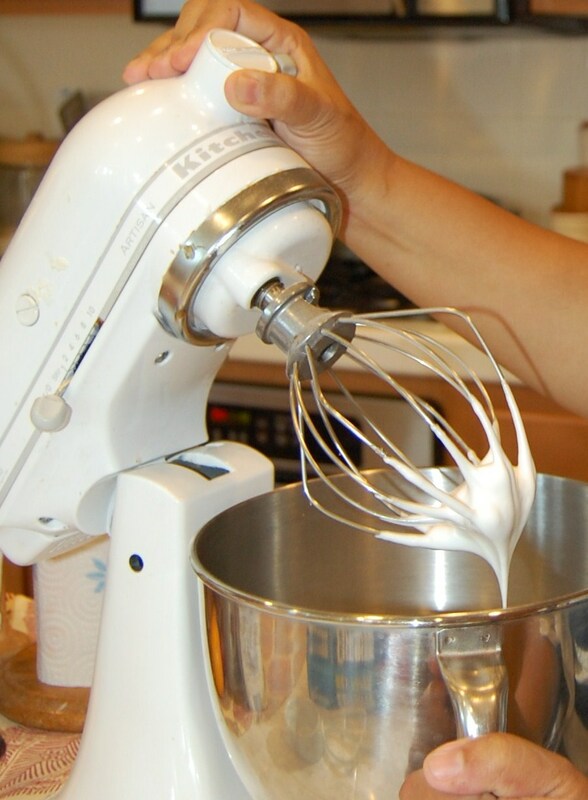 In a bowl with an electric mixer fitted with a whisk attachment, beat the egg whites until they are foamy, begin to rise and hold their shape. While whipping, gradually beat in the granulated sugar until very stiff and firm, approx 2 minutes. Using a rubber spatula, carefully fold the dry ingredients into the egg whites in two batches. When the mixture is just smooth and there are no streaks of egg white, stop folding and scrape the batter into the prepared pastry bag. Pipe the batter onto the parchment or silpat mat in 1" or 1.5" circles making sure they are evenly spaced about 1" apart to account for any spreading. Rap the baking sheet firmly on the counter a few times. This will help flatten the batter so there are no peaks. Rest for 30 minutes. Then bake for approx 10-15 minutes. Let cool completely, then remove from the baking sheets. Pair up the Macarons according to size. Pipe some nutella on the flat side of one of the Macarons and top with the other Macaron to make a "sandwich". 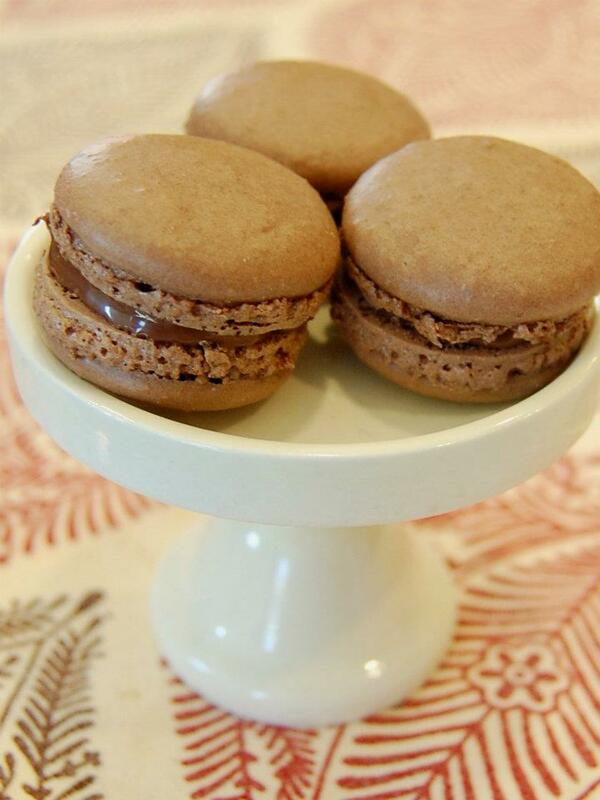 Some recipes recommend waiting until the next day to eat your Macaron so the flavors have developed. We ate ours after a few hours and they were delicious. Note: If you don't want to use plain Nutella filling, make a chocolate ganache filling instead or a Nutella buttercream filling. 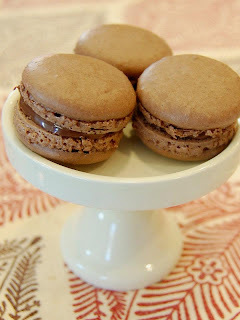 There are so many different types of filling that will pair well with this basic chocolate Macaron.